Knowing how horses learn and understanding timing and pressure will make you a more effective teacher for your horse. Horses learn quickly. In the wild, they learn to read the environment and react in ways that will save their lives. Horses must learn if a sound or object is dangerous to the herd or safe to ignore. If horses didn’t learn quickly, they would be in a constant state of fright and flight. Instead, they read situations in a moment and immediately know how to respond. This quick learning also applies when horses are under saddle. A horse feels the slightest rein and body cues from his rider, and knows if there’s a benefit to responding right away. 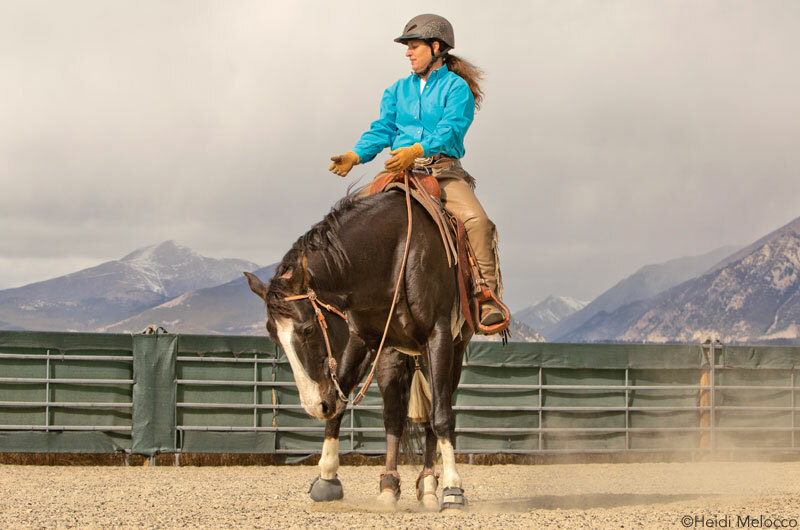 Responding to a cue means that the horse should feel a release from bit or leg pressure. The cue is applied (as pressure) then must be immediately released (stopping pressure) when the horse does what was asked. Horses seek the release. Sometimes, horses learn what we humans think is the wrong answer. If your horse is taking a long time to learn a new skill, pause and think through what he’s doing instead of what you want. The way he’s acting is the way he feels safe and at ease; it’s what he’s motivated to do. Your horse may teach you that you need to try a new cue or improve your timing of the release. If your horse has had long-term success doing what you deem the wrong behavior, it may take a new strategy and increased pressure (mental or physical) to motivate him to change his ways. For instance, if a horse has received a benefit from acting up or holding his head too high, he has been programmed over time to think that’s the right thing to do. We have to be smart to figure out what we can do to teach the horse that the “right” answer is easiest to do. Recently, a student was frustrated after working hard to teach her horse to ride with a low head position. No matter what she did, the horse had a high head carriage. The rider said she had been working on this skill for a long time, and nothing seemed to change. The rider was working too hard to teach the horse to carry his head lower. The horse felt her constant rein cues to lower his head, but he was never rewarded when he started to lower his head or change his position. Horses learn from the release of pressure. We call this kind of training “negative reinforcement.” It’s a confusing term because “negative”doesn’t mean pain or punishment like most people think. Instead, it refers to the absence of pressure—the release. Think of the term “negative space” in art. It simply means that there’s nothing there. To train with negative reinforcement, you apply pressure in the form of a cue, wait for the horse’s response, then immediately release the pressure when the horse begins his response. You must reward the horse for even the slightest effort. Many times riders get caught in a struggle because they wait for the horse to do a perfect movement before releasing pressure. But since the horse learns from the release, noticing and responding to the slightest try will help the horse learn more quickly. In the case of the rider who wanted to teach her horse to lower his head, she applied rein cues (squeezing gently with each stride of the horse’s trot) but never stopped cueing when the horse started to lower his head. Instead, he could only get away from her constant bit pressure when he raised his head up. He felt a release from pressure by raising his head because it shortened the distance from the rider’s hands to the bit and gave him a place to feel relief. It wasn’t the right answer for the rider, but the horse had learned what felt best for him. To change this behavior, the horse had to learn that there could be a release when his head was down. The release had to be dramatic and given at the moment his head lowered even an inch. When the horse lowered his head, I stopped rein pressure and loosened the reins to show him what I thought the right answer should be. With good timing and an obvious release, the horse learned a new answer in about 15 minutes. Not only does the horse need to feel a release to learn, he needs to feel the release at the exact moment he makes the move you want. A high-headed horse may carry his nose in the air all the time. If he accidentally lowers his head (to cough or scratch an itch) and the rider’s timing is spot on to notice the head position and release rein pressure, the horse can quickly learn that there was a release at a new head-holding position. If he got the release immediately, he will try for a release in the new position again. 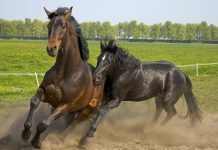 For horses to learn as fast as possible, the release of the cue (or the application of pressure, depending on what you’re teaching) must come within three seconds of the horse’s behavior. While you have a three-second window to teach your horse, the faster you can be within those three seconds will help the horse learn faster. The goal is to make the correction or release pressure within a half-second. The horse will associate his behavior with your reaction and learn at the fastest rate if you are speedy with your release. Master trainers have the half-second timing down. It can be tough to learn to respond that quickly, but it is possible. Your horse will still learn if your response is within the three-second window, it will just take more time. 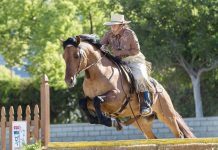 The more you pay attention to what you’re teaching and when your horse is getting a release, the better teacher you will be—and you’ll quickly see just how fast-learning your horse can be. What’s Your Horse’s Personality Type?